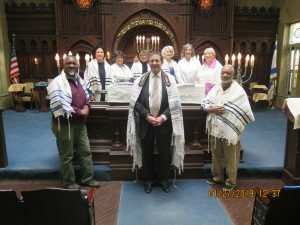 As the oldest continuously operating synagogue in the City of Newark, Congregation Ahavas Sholom is an Egalitarian Conservative Synagogue with a traditional service that welcomes all Jews, fulfills their spiritual needs, provides educational and cultural experiences. The synagogue’s mission states that Ahavas Sholom is passionately committed to the pursuit of Tikun Olam (repair of the world) and Tzedakah (social justice). Ahavas Sholom recognizes as part of Tikun Olam that it has an obligation to the environment, physical space and activities of the community. We therefore consider support for the conservation of open space, the creation of both passive and active recreation in Newark and among communities within its metropolitan area to be part of our mission. Ahavas Sholom is characteristic of other religious institutions in Newark. Just as many inner-city churches draw the greater part of their members from outside the city itself, Ahavas Sholom now has relatively few congregants who live in Newark. American cities are redeveloping in part as their unsurpassed cultural and religious institutions attract suburbanites to meaningful experiences. Ahavas Sholom is holy ground. It inspires those who step through its doors to pray, think, and learn, and to care about each other’s lives and the life of the community. 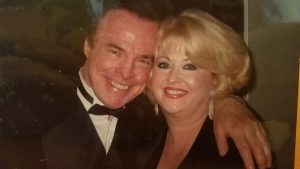 Russell Moy, who was Marianne’s husband, performed and recorded with Tony Bennett, Sammy Davis Jr., Connie Francis, Pearl Bailey, Vic Damone, Jack Jones, and Bobby Rydell, among others. He was named one of the top jazz musicians at the New Jersey Performing Arts Center. 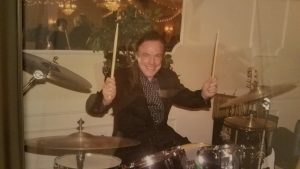 Russell taught percussion to others, for over 47 years at his own studio, and also as a faculty member of the Elon College North Carolina Music Festival. 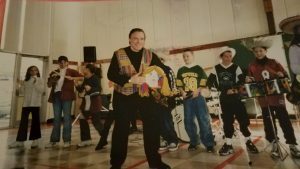 He was the first recipient of the Jim Chapin Teacher’s Award, a prestigious honor recognizing his lifetime service to the drum teaching world. His greatest pleasure was witnessing the progress of his students, many of whom now have successful drumming careers of their own. It is so fitting that we honor Russell through this scholarship fund. We welcome your support in keeping his legacy alive and well. Please join your friends at Ahavas Sholom in honoring both Russell and Marianne for both their contributions and journey together. Your support is greatly appreciated and is tax deductible. Donations can be made by credit/debit card and PayPal here. To donate by check, make the check out to Congregation Ahavas Sholom, noting “Russell Moy Scholarship Fund” in the memo. Send all checks to Congregation Ahavas Sholom, 145 Broadway, Newark, NJ 07104. Bottom Row: Tim Bezalel Lee of Newark, Rabbi Simon Rosenbach, and Daviyd Hawkins of Newark. Top Row: Wanda Rubinstein Gohler of Newark, Flora Sonners of Parsippany, Alla Eicheldinger of Newark, Marianne Moy of Roselle Park, Joan Podnos of West Orange and Linda Bloom of Bloomfield. On Saturday, March 16, 2019, the Ahavas Sholom community celebrated eight of our members who were called up to the Torah as adult B’nei Mitzvah. For many weeks the group studied and prepared for this day, under the leadership of Rabbi Simon Rosenbach. They are men and women, mostly in their 60’s, from many differet Jewish backgrounds, who have been waiting a lifetime for this opportunity. Some were born outside the United States, some were born into another religion, and some were just never given this opportunity as a 12 or 13 year old. To read the New Jersey Jewish News article about our eight adult B’nei Mitzvah click here. If you have any questions please call Jeff at 973-207-3095. Congregation Ahavas Sholom meets every Shabbat morning, starting at 9:00 a.m. for services and Kiddush lunch. On periodic Friday evenings we hold Friday night services followed by a communal Shabbat dinner. We also come together for Rosh Hashanah, Yom Kippur, Succot, Shemini Atzeret, Simchat Torah, Chanukah, Tu B’Shvat, Purim, Pesach, Shavuot, and Tisha B’Av. Please join us for Shabbat or the holidays if you are coming into Newark for business or pleasure. If you need information on hotels, motels, restaurants, and Jewish life in the greater Newark area call Jeff at 973-207-3095. Take Broad Street north. Instead of turning left onto Bloomfield Place, continue straight. One block later turn left onto Gouvernor Street, and then right onto Broadway. turn right into the parking lot between the Synagogue and Clinton Memorial AME Zion Church. Bloomfield Avenue east into Newark. immediately •turn left into the parking lot between Clinton Memorial AME Zion Church and the Synagogue. Garden State Parkway to exit 145 (Route 280 east). Route 280 east to “First Street, Newark” left –hand exit. Left onto First Street—one-half mile to its end at Park Avenue. Right on Park Avenue. Cross Branch Brook Park and continue one-half mile down the hill. Park Avenue. ends at Bloomfield Avenue. Cross Bloomfield Avenue. Onto Crittenden Street—two short blocks on Crittenden. Immediately turn left into the parking lot (between Clinton Memorial AME Zion Church and the Synagogue). George Washington Bridge or Lincoln Tunnel to NJ Turnpike (Route 95). Exit 15W (Route 280). 280 west for three miles. Immediately after the Passaic River drawbridge, take Exit 15A (Route 21 South). Keep straight. Left onto Gouverneur Street. to its end. Right onto Broadway.